1 - It prevents sparks and burning debris from getting out of your chimney onto the roof or surrounding areas. Chimney caps are sometimes called “spark arresters”. 2 - It keeps rain from entering your chimney. Water is very destructive to the inside of your chimney. It mixes with the creosote inside your chimney, which eats away at the mortar inside. Also, rain causes the metal parts inside your fireplace, such as the damper, to rust. A chimney cap acts like an umbrella on top of your chimney to keep out the rain. 3 - It keeps out birds, squirrels and other animals. 4 - It keeps out leaves and branches. Chimney Clean Company sells and installs a chimney cap made by a company called Chimney Products Inc. This premium cap comes in coated steel or stainless steel, and has a warranty from the manufacturer. We have installed over 10,000 chimney caps in the Bay Area! 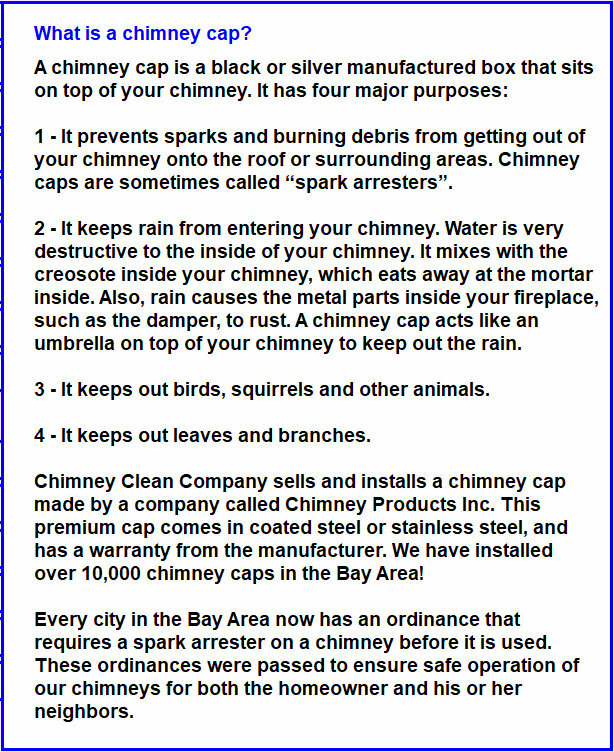 Every city in the Bay Area now has an ordinance that requires a spark arrester on a chimney before it is used. These ordinances were passed to ensure safe operation of our chimneys for both the homeowner and his or her neighbors.